Well... the birding gods decided I was worthy of a good bird after a fair dry spell. I have mixed feelings about being away for field work because I am in a part of BC that has great potential for rarities, but I consistently miss all sorts of rarities on my home turf. My feelings get heavily swayed towards field work when I strike pay dirt, which is exactly what happened yesterday (May 21). I finished up my bird surveys at around 10 a.m. and put in a couple extra hours looking for amphibians and reptiles, then I decided to attempt to show my field assistant, Alexis, some Bobolinks. I was surprised to find Bobolinks just outside Edgewood during my first field season in the area four years ago, but I later learned the local birding community was well aware of their presence. After checking a couple fields and striking out, I decided we would head down Ferret S Rd. (not found on Google Maps, actually) which passes another suite of suitable Bobolink fields. Eventually we managed to get views of a half-dozen Bobolinks making their amazing, bubbly songs, often as part of an aerial display. Already reeling from the awe of the Bobolinks, we heard a Long-billed Curlew in the distance and then found a Lewis' Woodpecker in a dead-topped cottonwood near the meandering creek that winds through the area. In an adjacent cottonwood, I was able to look up and have a Western Tanager, Bullock's Oriole and Western Kingbird in the same field of view. I would have left a very happy camper at that point, but then the bomb dropped. As I drove along, I noticed a sparrow flying parallel with the road. I thought it might be a Clay-coloured and just wanted to confirm that identification. It was playing coy so I stopped the truck and got out to track it easier. I eventually got nice looks at what was indeed a Clay-coloured Sparrow. It landed in a pile of brush at the roadside where I directed Alexis to its location. As we watched it, a black-and-white bird popped up. I said "It's a Bobolink!" We didn't have really close views before, so this was going to be a treat. The bird was obscured by a few branches, so I took several steps to one side to get a clear shot. Then I realized the bird didn't have that golden-yellow nape patch that makes a Bobolink so distinct. It was a male Lark Bunting! That's right... LARK BUNTING! I dropped some expletives and told Alexis to keep an eye on the bird while I bolted to get my work camera. I did a 100 metre dash to the truck and back and managed to snap off a few record shots and watch the bird for another half-minute before it flew to a fence post in the field. As it flew, I noted the nice white corners of the tail. Fantastic! This was a bird I had always dreamed of finding in BC! Bobolink is the only bird you could possibly confuse with a male Lark Bunting... unless you're special and think it's a terrestrial Pigeon Guillemot! Several features distinguish this Lark Bunting from a Bobolink. It's not a tricky identification! 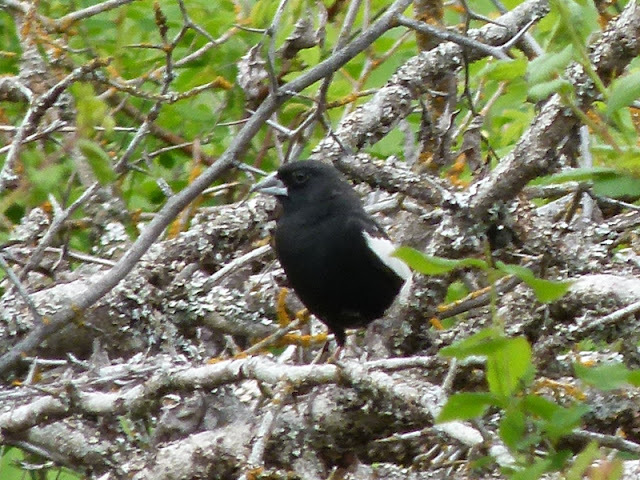 Note the lack of a golden-yellow nape, the white is limited to the wings, and the bill is large like a grosbeak and slightly blue-grey. 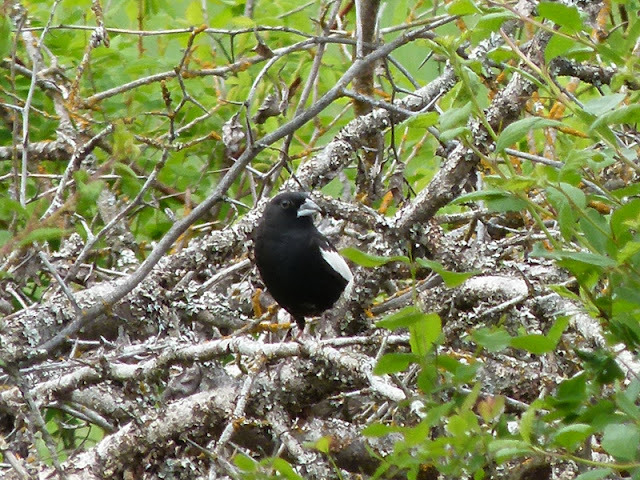 Surprisingly, Lark Bunting has more than 25 previous records in British Columbia! I thought this sighting was comparable to my 2009 sightings of Northern Parula and Chestnut-collared Longspur during the same project, but those two have fewer than 20 records apiece. Regardless of such tedious and unnecessary comparisons, this medium rare bird sure added a little spice to an already amazing day! What else is out there waiting for someone to find?! ?